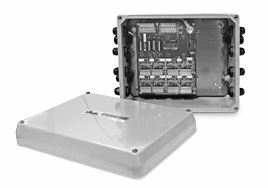 This signal trim junction box is highly durable, with a conformal coating applied to the electronic circuit board to protect against dust and moisture ingress. The JB8PST has an ingress protection rating of IP66. It features shunt jumpers allowing you to disable a load cell if required. The load cell connectors are removable and you have the capability to trim individual load cells, or a 'section' of load cells. Number of load cells: 2, 4, 6, or 8 (even number only). A member of our expert team will gladly help you find the right solution for your project or application.